The January jobs report beat expectations, and, coupled with upward revisions to prior months, confirmed that conditions in the job market have improved over the past year. I've argued for most of the past year that the expiration of emergency unemployment claims at the end of 2013 would result in an improvement in the economy (if you pay people less to not work, more are likely to work), and it now appears that this is indeed the case. John Cochrane discussed this recently, and he cites various studies that confirm that unemployment insurance weakens the job market and the economy. The economy is still far below its capacity, but on the margin things are improving—thanks in part to less government meddling with the labor market—and this is very good news. 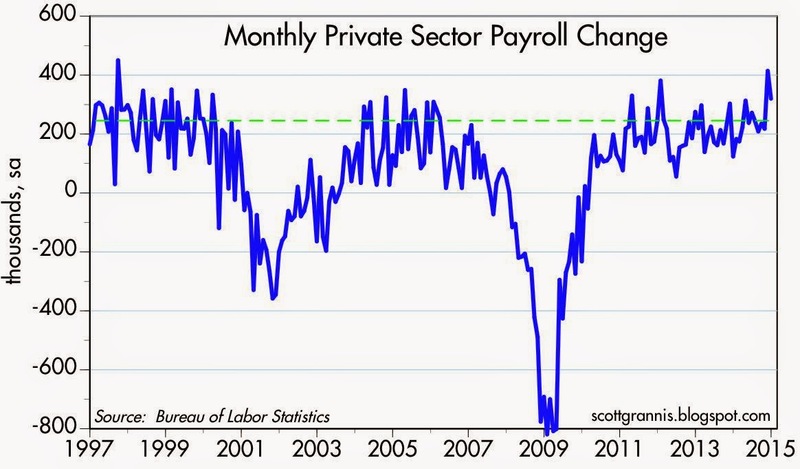 As the charts above show, there has been a noticeable pickup in the growth of private sector jobs over the past year. In fact, the rate of jobs growth now exceeds that of the best years in the previous business cycle expansion. 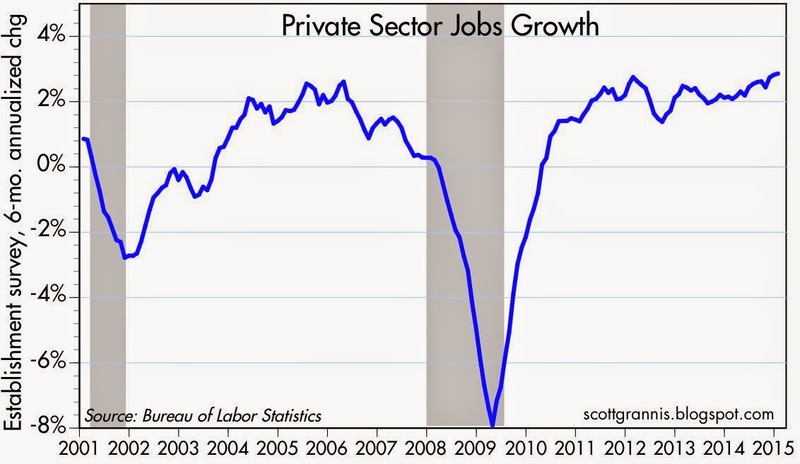 Yes: the jobs market today is doing better (in terms of growth) than at any time in the past decade. So why is the Fed keeping short-term interest rates at zero? That's a good question, and there is only one reasonable answer: because the market is still very worried that the good times won't last. There is still lots of risk aversion and worrying going on out there. The demand for money (cash, cash equivalents, and risk-free assets including bank reserves and T-bills) is still very strong, and the Fed has been forced to accommodate that demand with QE. Banks are apparently very willing to hold on to tons of excess reserves paying only 0.25% because their demand for those reserves is very strong. Similarly, individuals are willing to hold some $7.7 trillion in bank savings deposits (up strongly from $4 trillion at the end of 2008), despite the fact that they pay almost nothing. But things are changing on the margin. 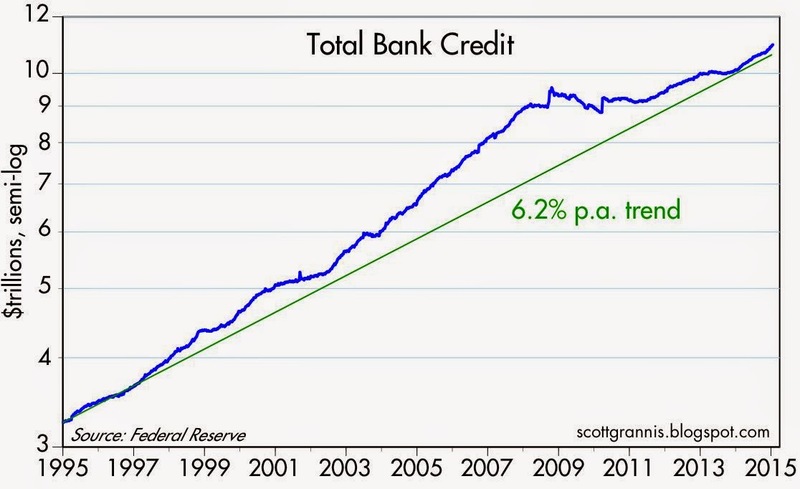 As the chart above shows, bank credit has grown 8.4% in the past year, and it has expanded at a 10.7% annualized pace over the past three months. Over the past year, banks have begun to use their reserves (finally!) to expand their lending activity. 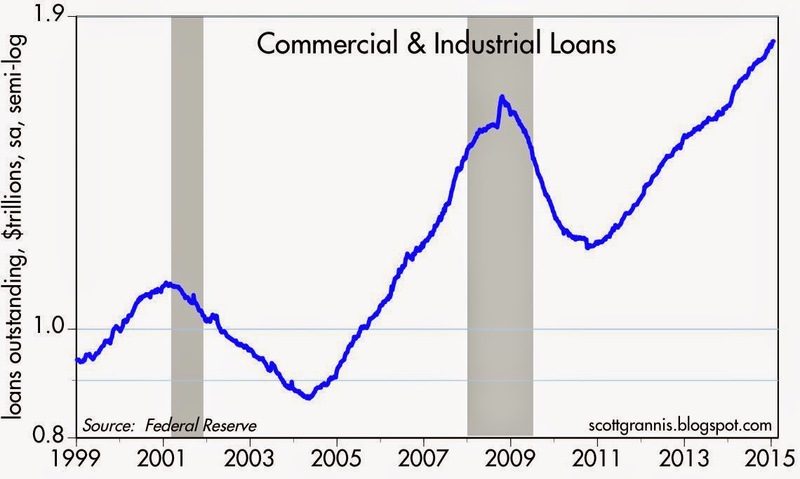 Banks are more willing to lend, and businesses are more willing to borrow: Commercial and Industrial Loans are up 13.7% in the past year, and they have increased at a blistering 15.1% annualized pace in the past three months (see chart below). Given the meaningful improvement in labor market conditions, and the substantial pickup in bank lending, we can infer that confidence is increasing and the demand for money is declining on the margin. That means that the Fed should be moving sooner rather later to raise short-term interest rates (and drain reserves), in order to offset the decline in money demand. The longer it waits, the more the risk of an over-supply of money that could fuel rising inflation. The current consensus of the market is that the FOMC will raise rates at its mid-June meeting. My growing sense is that's too long to wait. Nevertheless, I'm comforted by the dollar's impressive strength, and the decline in commodity prices, since both reflect a relative shortage of dollars. However, although gold has dropped 5% in the past two weeks (which also suggests a relative shortage of dollars), it is still trading at levels that are roughly twice the inflation-adjusted average price of gold over the past century, and that suggests a substantial over-supply of dollars. So the monetary tea leaves are mixed. I may just be overly cautious, but I don't see how raising rates to 0.5% or 1.0% in the next 3-6 months could be a bad thing, given how much economic fundamentals have improved over the past year. In any event, it's important to keep in mind that the purpose of moving rates up and down is not to slow down or to goose the economy, it's to keep the supply and demand for money in balance so that inflation remains low and stable. All the signs (rising confidence, increased lending, more jobs) suggest that money demand is declining on the margin, which means the Fed should be moving to offset that decline by increasing the rate it pays on bank reserves, and by draining the supply of reserves. I don't see how increasing the interest paid on reserves will affect the Fed Funds rate because there is so much excess reserves banks don't need to borrow overnight any longer. Their funding needs are fully met. There is no market to affect. So if decreasing liquidity by inactivating reserves isn't an option then the only thing they can do is sell bonds which would increase the supply of bonds and reduce the price. Perhaps it is only expectations that matter. Today the 10 yield spiked capping off a week of rising bond prices and the FRB didn't actually do a thing. The Fed funds rate is largely irrelevant now. The interest paid on reserves (IOR) is now the rate that sets the tone for all other rates. If the Fed is paying, say, 1% on bank reserves, then banks who need reserves will likely have to pay something close to 1% to borrow reserves on the Fed funds market. Yes, there are about 2.2 million Americans getting unemployment. I would eliminate the unemployment system entirely. But what Cochrane and others never want to point out is that there are 3.7 million vets getting "disability," for "service-connected" but non-battlefield injuries. They are getting paid not to work, forever, not for 30 or 90 weeks. The average VA monthly disability payment is larger than one would earn working at the minimum wage. But this not PC to talk about. And then there are another 8 million Americans collecting SSDA, although they do tend to be older, and appear to be taking early retirement at ratepayer expense. This should cause outrage also, but as it is FICA taxpayers who bear the burden, the GOP doesn't care that much. FICA taxes do not hit the rich. As for raising interest rates, the CPI seems to sinking. Europe is in deflation, and Japan too, and maybe even China. 30 years ago, the developed world had low double digit inflation. Not hyperinflation, not even close. But low double digits, for a couple years. Then single digit inflation through the 1990s, and very low single until recently, and now perhaps mild deflation. (Japan, of course, got to deflation earlier). Central banks have not adjusted. The rhetoric is the same, they contend their obligations are the same. Sometimes they contend they have no obligations, except to the zero inflation totem. Does it make sense for central banks to apply the same policies, and the same way for thinking, in 2015 as in 1980? I predict eventually central banks will change. The Bank of Japan may have already. (The Nikkei 225 is up more than 25% in last 52 weeks btw). The story going forward will be targeting growth. There may be tremendous opportunities ahead to cut taxes, or relief debt burdens, financed by QE. Yes, it is heresy. But it might work too. More and more tight money will get us nowhere. We have seen that in Japan. They had mild deflation for 20 years and it was a debacle--especially for investors. As you can see, by the PCE, prices are up 0.7% in last year (that is, less than one percent). They are mildly deflating now. As Milton Friedman said, you do not get to zero inflation and dead interest rates by years of easy money. 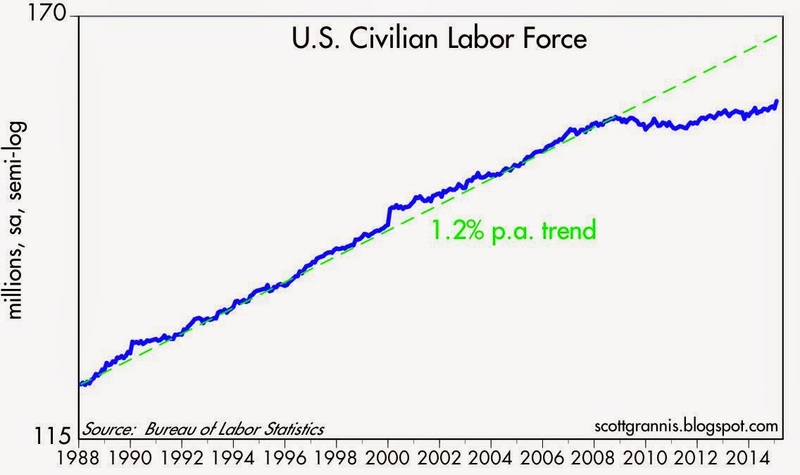 The Fed has been running a very tight monetary policy for years. And it vows it will get tighter. I hope for the best but this looks like a Japan repeat. Central bankers are not the quickest learners in the world, nor do they have to be. They do not operate in the private sector. They can ossify, worship ancient totems, make sanctimonious sermonettes, genuflect to hoary dogma. It may be the real damage will be to U.S. investors. We see US earnings hurt already, on the strong dollar. Next comes deflating property values. We are not in a Japan 1990 property-equity bubble, so at least there is that. But we could see a slow southerly drift in equities and property for a long time, while bonds actually hold up (although they will pay not much). Two observations: Core inflation (ex energy) is still running around 1.5%. It would take quite a few rate hikes before monetary policy became "tight." The initial moves, which would likely occur over a year or two, would have the effect of removing the "stimulus" from very low interest rates. The Fed will become less easy, not tight, no matter what they do this year. That is not a threat to anything. Monetary policy is not likely to become tight for at least several years, but that is not a prospect that encourages me. I don't see how Europe, Japan, and China are examples of tight money. They are examples of being too loose and have a debt overhang that restrains further economic activity. The problem that afflicts most developed countries, including China, is too much government: excessively high tax rates, and burdensome regulatory requirements. Milton Friedman said to not confuse low interest rates with easy money. Low interest rates are a sign of tight money and that money has been tight for a long time. No economy can get to persistently low interest rates by easy money. Sophisticated institutional investors now are willing to lend Uncle Sam money for 30 years at 2% and change. Small change too. That is not a sign that money has been easy for the last seven years. That simply does not stand to reason. The fact that central banks need to adapt to a new world does not mean that one should call for higher taxes or more regulatory burdens. Taxes should always be as low as possible, government limited, regulations scarce. Hey, if I were in charge, federal outlays would get cut in half, and there would be no HUD, Labor, Commerce, USDA, VA, or DHS. But do not conflate a growth-oriented monetary policy with big government. They are separate issues. Okay, an analogy, which is like an anecdote, and which proves nothing, but it fun to tell (who didn't love to listen to Ronald Reagan? The guy was great). I have an anorexic friend. Naturally, I told her to eat more, last time I saw her, about a year back. So I saw her yesterday. She said, "You know, I have really eased up on myself. I have been eating a lot more. In fact, in the last year since we talked, I have only lost four pounds." That describes our central bank. They have eased up, and we only face mild deflation now, and falling unit labor costs. Dudes, get yourself to Burger King, eat a triple decker with a large basket of fries, then head to Cheesecake Factory and put down some wedges, followed by some Cadillac ice cream alcoholic beverages at the bar. "Milton Friedman said to not confuse low interest rates with easy money. Low interest rates are a sign of tight money and that money has been tight for a long time." So we are now all in agreement that interest rates should rise. I thought we were all in agreement that we should have alcoholic beverages at the Cheesecake Factory. Scott, I have to admit I'm a bit baffled these days. I've been a fairly staunch lower rates/the Fed isn't going to do anything since around 2011, but of course i worry that I may be staying at the party a bit too long. i still don't quite understand how the fed is actually going to "raise rates". There are something like 2.5Trillion in excess reserves floating around which is 20% of M2, it's hard to argue there are too many dollars at the moment so is the fed actually going to remove $2.5 trillion in reserves over the next 4 months, and what would that do to the dollar and resultant deflation. It seems the fed is in a bit of a box and the easiest path is do no harm (ie: do nothing). just my thoughts. The Fed has two options available, and it will probably use both: draining reserves (reversing QE) and raising the interest rate it pays on reserves. It's going to take a long time to get rid of all the excess reserves, but raising the rate paid on the reserves accomplishes what is needed: a higher rate increases the demand to hold the excess reserves. Check out Dr. Copper. A good time to tighten monetary policy? Larry Summers, as you probably have seen, has a different view than yours. Would be great to hear your thoughts on this. "Gold is still trading at levels that are roughly twice the inflation-adjusted average price of gold over the past century, and that suggests a substantial over-supply of dollars."--Grannis. This one bothers me a little. I sense gold prices now are set in China and India--certainly, by volume, that is by far the largest market for gold. If 1.2 billion Indians and 1.5 billion Chinese have rising incomes, and a reasonable distrust of crappy governments, and an historical affiliation with gold--what has that to do with US monetary policy? Gold is a funny one. The Swiss National Bank just came close to buying tons and tons of gold. Egads. That might have driven up the price of gold. Again, what has the Fed to do with that? Silver has an even longer lineage as money than gold, and banks in China are referred to as "silver houses." Silver is another whacky one. You could buy an ounce in 1792 for $1.29. That price held for a long time, but then fell to about a quarter, or 25 cents in the Great Depression. There were drastic peaks and valleys thereafter, and lately silver is around $17 an ounce, but slipping. Silver, in general, has not maintained a stable value in relation to gold. Neither metal has maintained a stable value, to oil or much else. They used to say you could a suit of clothes for an ounce of gold, but today you could buy a few suits for that much. And oil just cracked--so gold will tumble? Well, my grandfather used to say, "All gold is fool's gold." Re Larry Summers: He believes the Fed should not raise rates until it is clear that inflation is about to rise above 2%. He prefers the Fed err on the side of inflation, because he believes that deflation is a black hole that will swallow the economy. I don't share that belief. I believe that the best monetary policy is one that delivers low and stable inflation, no matter what. I believe that low and stable inflation creates fertile ground for economic growth because it minimizes uncertainty and maximizes confidence in the value of money. I don't believe a little inflation is better than no inflation. I believe that the Fed needs to be proactive when it comes to rising inflation by paying attention to leading indicators of inflation. If they wait for inflation to show up it will take them a long time to bring it back under control, because policy always works with "long and variable lags," as Milton Friedman famously noted. I also don't believe that increasing rates from the zero bound presents any threat to economic growth. I think the Fed makes a mistake when they worry about the impact on growth of a minor adjustment in short-term interest rates. The Fed should always be focused on ensuring that the supply and demand for money is in balance. My reading of the tea leaves suggests that there is an emerging over-supply of bank reserves (the seed corn of the money supply) that needs to be addressed by tighter monetary policy. It is only in its infancy, relatively speaking, but it is occurring on the margin and is therefore something that needs to be addressed before it becomes acute. "So why is the Fed keeping short-term interest rates at zero? That's a good question, and there is only one reasonable answer: because the market is still very worried that the good times won't last." to markets broadly, I think the Fed is fundamentally concerned about keeping the stock market up for its believed wealth effect, and fears a boost in rates will cause it to fall. And I think it will because on the margin are carry traders who on the margin need to unwind or at least take profits.